6th and I (Eye) Streets, S.W. PARADE THE PARKS is free and open to the public; bring your own beverage. All three parks are ADA compliant - Southwest Duck Pond's accessible entrances are at 6th & K Sts SW and Makemie Place near K Sts SW. Waterfront Village, Friends of the Library, SW Gardens, and SWBID are your hosts for PARADE THE PARKS! 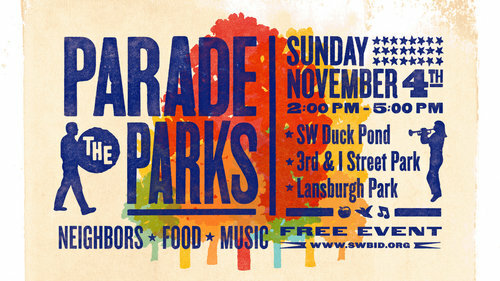 Join your neighbors for a parade through three Southwest parks: Southwest Duck Pond, the 3rd and I Street (Library) Park, and Lansburgh Park starting at the Southwest Duck Pond at 2pm to enjoy music, conversation, and refreshments at each stop.